Pineal Gland is a small gland located near the brain and primarily involved in the production and secretion of the hormone melatonin, which regulates circadian rhythms in many animals, including humans. 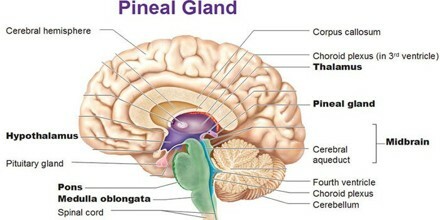 It is also known as the “pineal body,” is a small endocrine gland. It is located on the back portion of the third cerebral ventricle of the brain, which is a fluid-filled space in the brain. The pineal gland has long been an enigmatic structure. Even in the early 21st century, when sophisticated molecular techniques were available for biological study, fundamental features of the gland including the extent of the effects of its principal hormone, melatonin—remained incompletely understood. It is located in the epithalamus, near the center of the brain, between the two hemispheres, tucked in a groove where the two halves of the thalamus join. The pineal gland produces melatonin, a serotonin derived hormone which modulates sleep patterns in both circadian and seasonal cycles. Pineal Gland lies in-between the two halves of the brain. In adults, it is approximately 5 to 9 mm long and 0.1 grams in weight. It has a rich supply of adrenergic nerves (neurons sensitive to the adrenal hormone epinephrine) that greatly influence its function. Microscopically, the gland is composed of pinealocytes, rather typical endocrine cells except for extensions that mingle with those of adjacent cells, and supporting cells that are similar to the astrocytes of the brain. In adults, small deposits of calcium often make the pineal body visible on X-rays. 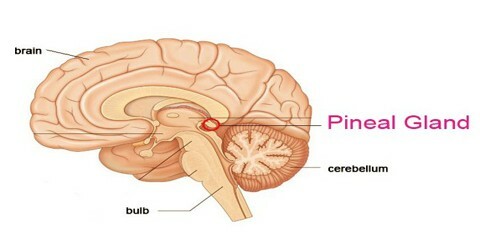 The pineal gland eventually becomes more or less calcified in most people. However, it is often larger before puberty. The gland is named for its shape, which resembles a pinecone (in Latin, “pinea”). It is composed of neuroglial cells, portions of neurons, and cells known as “pinealocytes.” Pinealocytes are types of endocrine cell. It is known to play a role in regulating female reproduction and sexual maturation. It also has a part in controlling circadian rhythms, the body’s internal clock that affects such actions as when we wake and sleep. 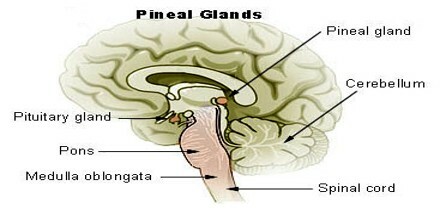 The human pineal gland grows in size until about 1–2 years of age, remaining stable thereafter, although its weight increases gradually from puberty onwards. The abundant melatonin levels in children are believed to inhibit sexual development, and pineal tumors have been linked with precocious puberty. When puberty arrives, melatonin production is reduced.